After finding your product market fit, you want to conquer the world! However, often companies fail to, why? Geoffrey A. Moore explains why it’s hard to make the transition from early adopters to the early majority and how to fix it. What is the Chasm? On the cover you can see the Technology Adaption Life Cycle. There are innovators and early adopters left to the gap and early majority, late majority and laggards to the right of it. The gap is actually the chasm. The problem that you face if you try to market your product to more “conservative” people, i.e. the early majority. Find a market segment: The first key step to cross the chasm is to look for an attractive market niche. In a niche people talk to each other which helps your marketing and establishes trust. People will recognize you early and help you to become a market leader in the first market segment. Deliver the whole product: After choosing your niche, you have to think about what you need to deliver your product. People don’t want to be beta-testers, i.e. you have to deliver them the whole solution. If your product needs integration, you have to offer integrators. If you product needs instructions, you have to offer instructions. Your main goal is to become the best supplier in your chosen niche. Become the market leader: After establishing your position in the niche, you can go into other areas and finally break into the mainstream market. It’s important to become the market leader or at least the third market leader. It’s important to be one of the bests, you don’t have to be one of the firsts. Moore estimates that you will need at least 25% of the market share to establish a long term position. 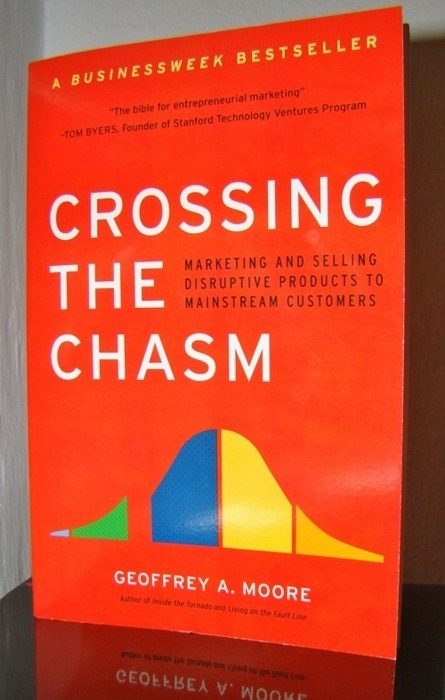 Crossing The Chasm is a bit wordy and could be written shorter. The examples are really helpful and make this concept easier to understand. I like it how Moore combined several methods (Technology Adaption Cycle, Whole Product, etc.) to create an instruction to how to cross the chasm. It’s a pretty nice book.